To help other people find and contribute to your project, you can add topics to your repository related to your project's intended purpose, subject area, affinity groups, or other important qualities. Under your repository description, click Add topics. 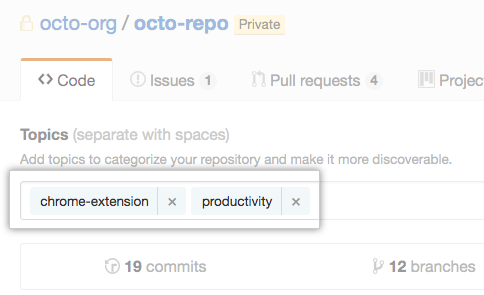 Type the topic you want to add to your repository, then type a space. After you've finished adding topics, click Done.